When I run CPU-Z to check the hardware details, it shows me that CPU is running at 1.5 GHz instead of 3.1 Ghz. The multiplier is being reported as half the original value. No overclocking, BIOS is set to optimal defaults. The CPU frequency is 3.1 in BIOS. Settings not modified. There's no overheating issue too. To note, which version of the BIOS are you for your motherboard? I assume that screenshot is taken when you're idling? What does Ryzen Master show you? 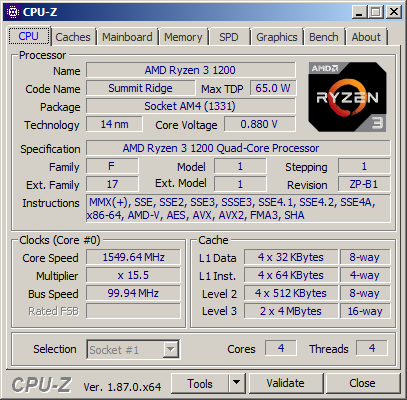 When I run CPU-Z to check the hardware details, it shows me that CPU is running at 1.5 GHz instead of 3.1 Ghz. Launch something cpu intensive and watch, how cpu frequency changes. Finally I figured it out! It was the ‘AMD Cool N Quite’ switch in BIOS that was enabled by default. Since I chose optimal defaults, I had no idea that it was enabled. I disabled it and CPU now runs at 3.1 Ghz. I enabled it and CPU runs at 1.5GHz again. So I am now sure that there’s nothing wrong with the system, it’s just the way AMD has designed this Cool N Quite technology. This PC is meant for general purpose computing, no CPU intensive apps are running.Thanks for your help. That is normal operation. When cpu load is insignificant, cpu clock gets reduced to save power. AMD has Cool and Quiet technology, Intel has Enchanced SpeedStep technology. They essentially do the same thing. As suggested before - run something cpu intensive - any cpu benchmarks will do. And cpu frequency will rise. Question 2 cores showing in the boot box, I have a quad core help.. Question Why does my allotted IGPU mem show up as less than I set in BIOS?